We agree with the general sentiment. Many objectively attractive male specimens — Ryan Gosling, Harry Styles, Idris Elba, Michael B. Jordan, Jesse Williams, James Marsden — have been sighted in billowy, tropical toppers. Still, it’s important to note that this is most definitely not a guy-specific trend…even though its more high-end takes still come to us mostly by way of the men’s collections. In 2016, it was Dries Van Noten’s palm frond and leopard print style that everyone had to have. 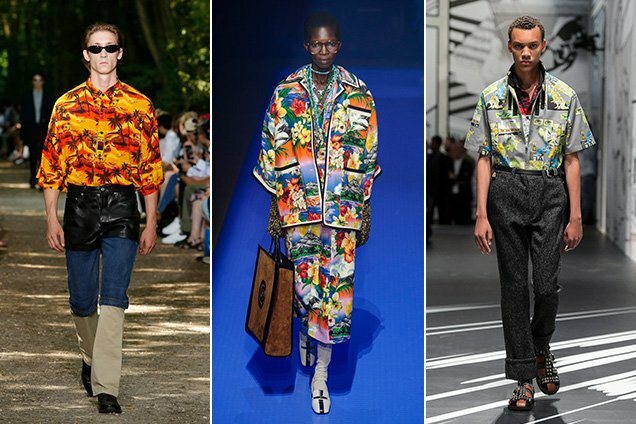 These days, it’s Balenciaga’s classic sunset-hued version (from the label’s Spring 2018 menswear collection), Prada’s crisp-collared designs (which, again, debuted during the Spring 2018 men’s shows) and Gucci’s pipe-seamed, pajama-esque iteration (refreshingly, a Spring 2018 womenswear piece) that are making waves. Many, ahem, “hot girls” have adopted and adapted the look, among them singer, model and writer Marz Lovejoy who, back in spring 2017, paired her peachy, pineapple-splashed top with camo cargos and red sneakers — albeit under duress. “This is what it looks like to style in your man’s [in her case, Office magazine editor Simon Rasmussen] clothes on blogs in Paris after Air France loses your luggage because style can’t be bought and light cannot be shaded. And I’d do it again with a white tee and a safety pin,” she wrote under the above post. Notice how Lovejoy left most of the buttons unfastened to manipulate the shape and lines of the blouse — an easy, interest-adding trick. 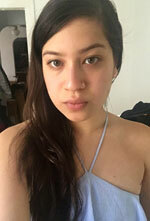 Here’s another idea: if you’re looking for something more fun than your typical linen beach cover-up, try a Hawaiian shirt in a bright color or contrasting pattern over your bikini, à la model Paloma Elsesser. It’ll add some tropical zest to your finite, oft-Instagrammed swimsuit rotation. Even if you don’t have a beach trip planned anytime soon, you can always throw one of these babies on and immediately feel the summer vibes. During the actual summer, leave a few buttons open and tuck it into jean shorts. Or take a page out of Chiara Ferragni’s stylebook and wear it with a bra top and some high-waist bike shorts (another hot-ticket Summer 2018 item). Alternatively, skip the bra top and just MacGyver your Hawaiian shirt into a front-tie crop.